Tuesday, August 7 is Heartline’s Annual Day of Prayer. Throughout the day, our staff and prayer team will be praying for Haiti, the children and families we serve, and you. We’ve included some prayer requests and prompts below to inspire your prayer time and invite you to join us as we lift up Haiti, Heartline, and one another. It is an honor to partner with you in this ministry and a privilege to pray for you. For God to empower Haitian families to stay together, support each other, and grow in Christ. For God to release Haiti from the strongholds of marginalization, oppression, and extreme material poverty. Pray for government officials to work with integrity, humility, and honesty. Pray for Haiti’s leaders to hear the concerns of their citizens and act in the best interest of the Haitian people. That Haiti would continue to experience calm after the political unrest earlier in July. For peaceful resolutions to the complex issues facing the country. Pray for economic growth, increased job opportunities, and provision for the vast majority of Haitians who are struggling to provide for the basic needs of their families. For the maternal health care crisis in Haiti– That women and babies would have access to the lifesaving care they need. 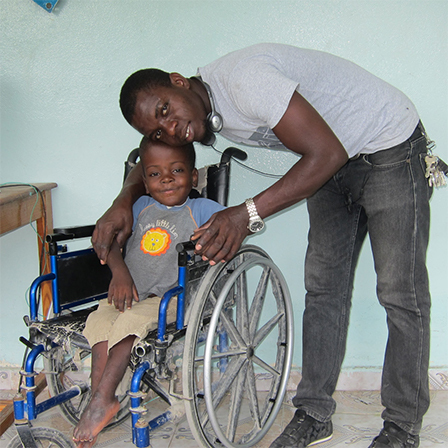 Pray for improved options for care in Haiti’s healthcare system. That Haitians will put their hope in Jesus. That each and every one of our actions would be guided by our core values: relationship, integrity, and shalom. For our staff to discern and follow God’s plans for Heartline. For unity amongst the Heartline staff, that we each understand our individual roles and how they help accomplish the mission. That we all have a desire to serve sacrificially and to put others above ourselves. That we would all be honest with ourselves, each other, and the mission. For protection, safety, and health of all Heartline employees. For the individuals and families served through Heartline programs. For funding to continue all Heartline programs. For preparations for the 2019 budget, that it would be vision led. For discernment in stewarding the gifts that have been generously given. For mutually transformational partnerships with individuals, churches, and foundations. Pray for the Heartline Board members. Lovely had her baby girl in July, during a time of great political unrest. She hemorrhaged at the hospital where she gave birth. She is now home and recovering. Lovely knows that God protected and provided for her and thanks everyone for their prayers. Join us in praising God that all mothers who have given birth in the Maternity Center program this year are living! Haiti still has the highest rate of maternal mortality in the Western Hemisphere, so this is a blessing we never take for granted. The MC has 55 more babies due before the end of 2018. We ask God for full term deliveries with joyful outcomes. Please pray for staff to have wisdom in each of those situations and deliveries. Pray for Islande and Stephanie (two Maternity Center nurses who are currently in school at Midwives for Haiti). Pray for them as they study and prepare to return to the Heartline Maternity Center in 2019. The MC is grateful for several new donors and supporters! We are also giving thanks for the many organizations and individuals that faithfully give to keep our birth center running 24 hours a day, 365 days a year. Praise God for the Heartline “Starting Place” manual and the first corresponding class to be held in September. We aim to share the Maternity Center’s model of care with the prayerful hope that it will be duplicated across Haiti and in other developing countries. Prayers and praise for each individual Maternity Center staff member. Pray for the 20 individuals in Heartline’s Savings Group. Pray that the group would be able to provide loans when needed, specifically for schooling needs this fall. Pray for the Kids’ Club ministry to have a place of their own so that children in the community can continue to learn about Jesus, play with friends, and develop relationships with loving Haitian mentors. Janesse: For God to touch the hearts of his mother and father. For his family to come to know Jesus. Donalson: Protection, provision, and blessing for his family. Jean Mary: To be married in 2019. Reginald: For continued growth in his spiritual life. For God’s protection and provision for sponsored students and their families. That each sponsored child would come to know Jesus as their personal savior and constant companion. That the students would experience the deep, never-ending love of Christ and know the value they have as precious children of the King of Kings. Wisdom, patience, and kindness for teachers and Heartline staff as we try to support several students who are struggling to make progress in school. Gratitude for students, teachers, and staff who put so much work into the graduation ceremony that took place over the weekend. Wisdom and direction for important decisions about next school year regarding staffing and classes. Praise for God’s provision throughout a very challenging year for the Education Center. Praise for the faithfulness of committed staff members and hard-working students at the EC! Would you like to know how you can pray for Haitian families and Heartline throughout the year? Click here to learn more and become a Prayer Partner.